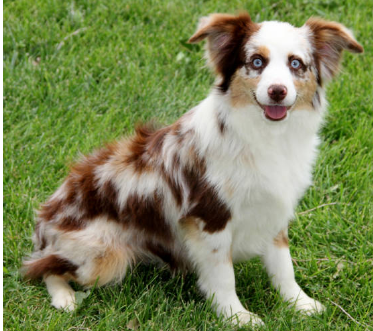 These darling Toy Aussies make the greatest pets. They adore children. Beautiful coats easily maintained. Training is a breeze due to them being born smart! Ours are pet door trained from 5 wks. of age, weather permitting. 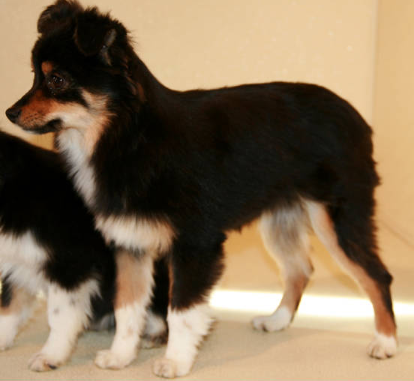 We are producing 3rd, 4th & 5th generation Tug@YurHart Toys Australian Shepherds. Be sure to read our Guarantee,Puppy care, & Guestbook pages from our previously placed pups! We can ship your Toy/Miniature Australian Shepherd puppy to your state for $345-$400 (Only $475 for 2 puppies in the same crate). 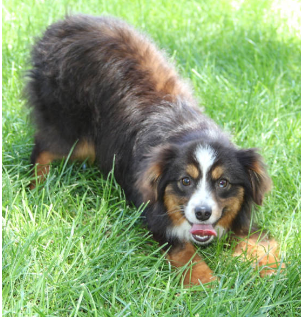 Can fly your Toy Aussie puppy to Denver, CO for $150 to be received at Centennial Airport morning & evening flights. Crate comes with flight. They are happy, friendly, eliminating outdoors now that the weather has changed and received 4 puppy vaccinations as well as had many bathes and nail trimmings. "Allie" AVAILABLE $1700 pet only or $1900 with her NSDR. Blue Merle Toy Aussie female * 2 blue eyes 9# at 4 months of age. "Rio" GONE HOME TO TYLER B. OF PRAIRIEVILLE, LA $1600 or $1800 with her NSDR. Blue Merle Large Toy Female with 2 brown eyes. *5# at 7 weeks. "Raisin" AVAILABLE $900 Black-tri LargeToy Female *5# at 7 weeks. ***Our Toy/Small Miniature Australian pups are always vet checked, prior to coming home to you if sufficient time has been given. We also administer their vaccines & dewormings on a timely schedule (please go to our puppy care page). We give a 1 yr. health guarantee on puppies $800 and up. Our puppies are pet door trained to eliminate outdoors. Weather permitting of course. We like our Toy Aussies to be right at 3# before going home. Sometimes this means keeping them until 9-10 wks. of age. Extra attention needs to be given to tiny puppies to assure their good health. 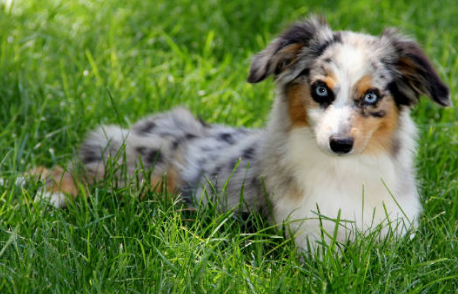 "Kaala" AVAILABLE $1800 Blue Merle Toy Aussie Toy Aussie female with 2 blue eyes! "Kam" AVAILABLE $1600 Blue Merle Toy Aussie male with 2 blue eyes! Tug At Yur Hart of CO has Toy/Miniature Australian Shepherd puppies listed for sale on puppyfind.com, k9stud.com, puppysites.com and breedersclub.net. Kansas (Black-tri f) & Patriot (Red Merle m)have these 2 available Toy Aussie female puppies born February 2, 2019 ready March 30, 2019. 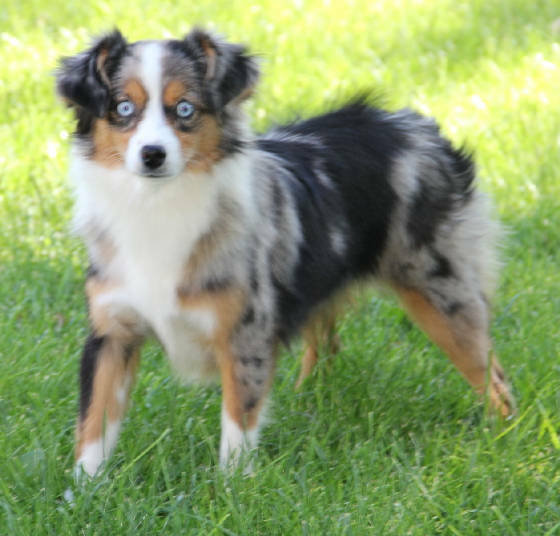 "Prissy" RESERVED BY ERICA G. OF ECKERT, CO $2200 Toy Blue Merle Aussie female with 1 blue and 1 brown eye. 2# at 6 weeks of age, predict under 10# at maturity. This is Pepper as a puppy. He is the sire of Bubbles. 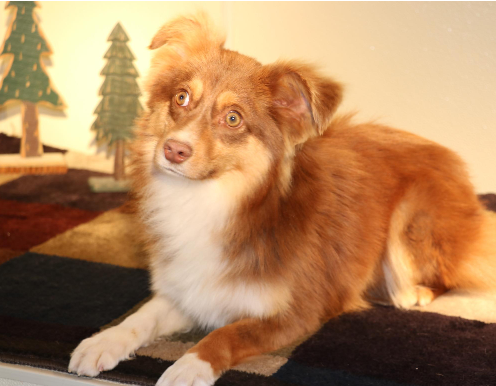 "Perfecta" GONE HOME TO JERRY & EVELINE K. OF TAMPA, FL *Their 2nd Toy Aussie from us! 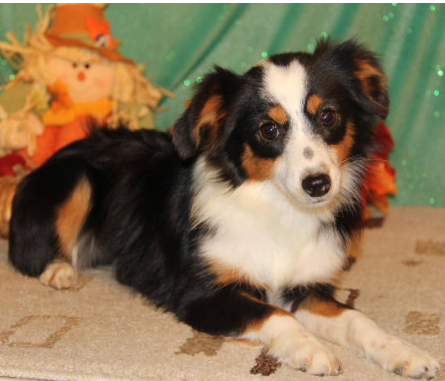 $1800 Dark liver Red-tri Toy Aussie female. 2# at 6 weeks of age. Predict under 10# at maturity. Firefox and Cowboy Up produced this beautiful litter of 3 Toy Australian Shepherd Tri females . Born March 21, 2019 ready May 16, 2019! Roxy & Sidekick are the proud parents of 7 beautiful Toy/Miniature Australian Shepherd puppies born 3/29/19 ready 5/24/19. I think all the boys have blue eyes at this point! 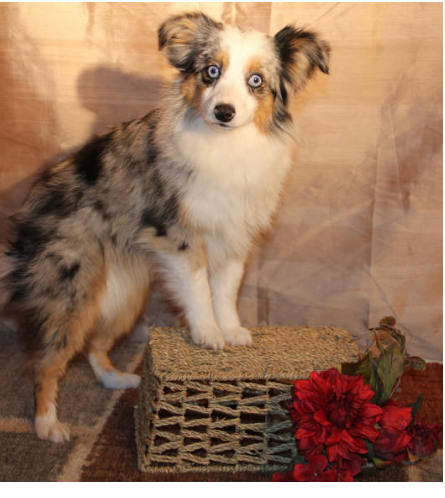 "Rosco" AVAILABLE $1700 Mismarked Blue Merle Lg. 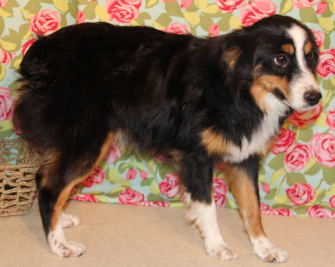 Toy/Sm Miniature Australian Shepherd male *very likely 2 blue eyes! "Rambo" AVAILABLE $2800 Lg. 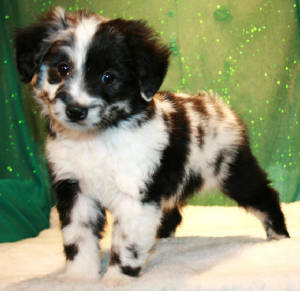 Toy/Small Miniature Australian Shepherd black-tri male *Nicely marked puppy with full white collar and 2 blue eyes! "Ranger" AVAILBLE $2000 Lg. 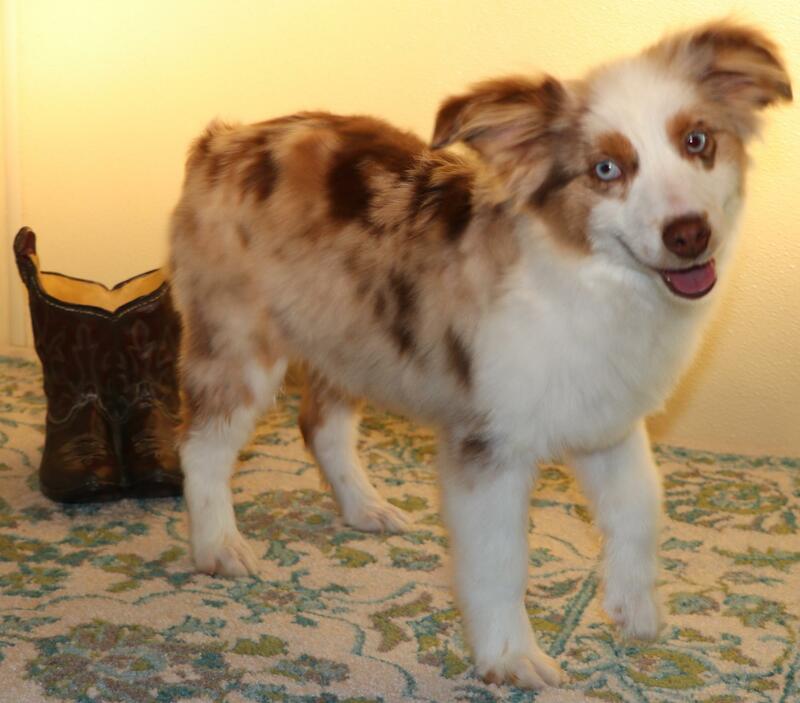 Toy/Small Miniature Australian Shepherd Blue Merle male *full white collar and verly likely blue eyes! "Reeder" AVAILABLE $1700 Mismarked Lg. 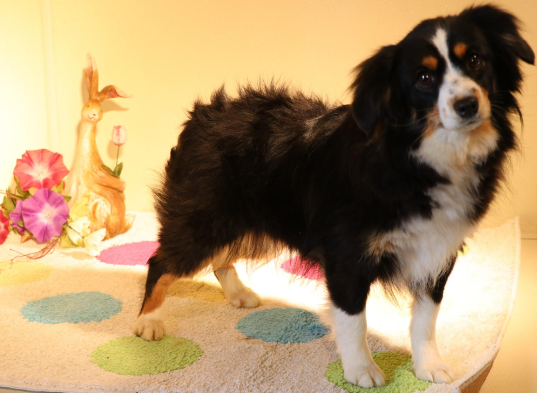 Toy/Small Miniature Australian Shepherd male *verly likely blue eyes! "Peach" is going home to her new dog mom Jane Elliott" A 2nd Toy from us! 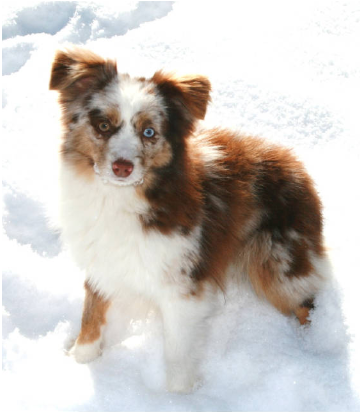 $2400 Toy Australian Shepherd Red Merle female *very likely blue eyes! Laney & Forrest have this litter of blue merle Toy Aussies with no copper markings born 4/8/19. Will be ready for their new homes 6/3/19.